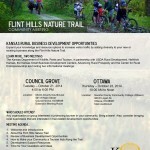 The Kansas business and tourism community is beginning to recognize the huge potential economic impact of the Flint Hills Nature Trail. 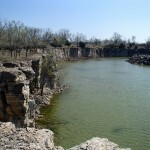 The Melvern Riverfront Park and Trails are located in Melvern, Kansas and feature several miles of hiking and biking trails along the Marais des Cygnes River. Here are some photos of the trails. Marysville Depot Saved, Kanstarter Group Funding for Trails, Lawrence Receives Trail Grant, Development along Bikeways Soars, Annual Meetings for Rail-Trail Organizations, and more trail news from the Sunflower State. New Missouri Trail Proposed, Landon Trail Connection, Coronado Heights Restoration, Home on Range Cabin, Jayhawk Trail, Sunflower Foundation Grants, and more trail news from the Sunflower State. The Sunflower Foundation has announced their latest grants for community trail development, part of their commitment to making Kansas one of the best trail states in the country. KDOT approves federal $1.9 million grant for Flint Hills Nature Trail, Smoky Hill Recreational Trail Grant, Iola Rail Trail Construction to Begin in October, and more trail news from the Sunflower State. 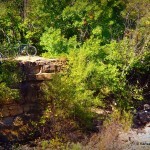 Kanopolis State Park Trails, Sunflower Santa Fe Trail, New Rails-With-Trails Report Released, Trail Running Popularity Increases, Interpretative Signs On Rail-Trails, and more trail news from Kansas and beyond. Iola is poised to cement its growing reputation as a trail town with the addition of the Lehigh Portland Rail Trail and new mountain bike trails. Overbrook Trailhead Dedication, Sunflower Santa Fe Trail Progresses, Switchgrass Trail, Flint Hills Nature Trail Design Workshop, Prairie Sunset Trail, and more trail news from around the Sunflower State.